Jeff Johnson and Wendy Sweet have decades of experience in the real estate business. Jeff has built a successful Rehab business and Wendy has facilitated hundreds of financial transactions. 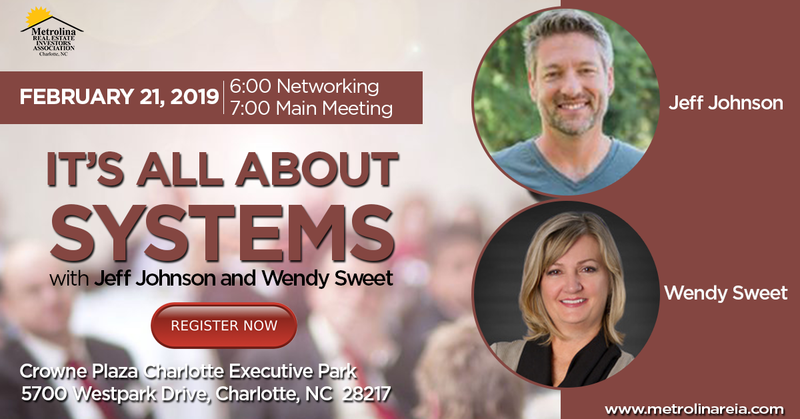 They are pros at what they do, and will share with us the secrets of Systems they put in place that help build their business. Both Jeff and Wendy believe in giving back to the community. Jeff hosts the Advanced Investors and Rehabbers subgroup, and Wendy has hosted the Friday morning Sonrisers subgroup for over 15 years!! And they both offer individual mentorship sessions for FREE! Come find out how these successful people have built their business, and how you can build yours!! Directions: I77 exit 5, Tyvola Rd.